At the end of every year, there is a laboratory that constructs an unusual building in front of Faculty of Engineering Building 1. Two years ago they built a structure that looked like it was made out of shuriken (ninja stars), and last year's building appeared to be a large object made of wooden chopsticks. The person behind these strange structures is Professor Obuchi, who contributed the following article for this edition. Since this professor is a little different from the norm, we had him introduce his unique and original research and teaching styles in a self-interview format, which is a little different from the norm for this column. 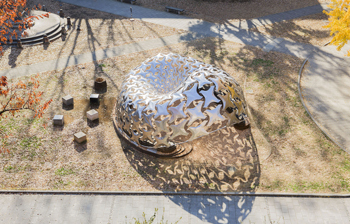 STIK (Smart Tool Integrated Konstruction), the pavilion built by Professor Obuchi's laboratory in front of Faculty of Engineering Building 1 in December 2014. This structure, which looks like a bunch of Baby Star Crispy Noodle Snacks hardened and enlarged, was made using networked handheld 3D printers (a chopstick dispensing tool) and one million disposable wooden chopsticks as building materials. The STIK project was created in collaboration with Professor Jun Sato of the Graduate School of Frontier Sciences, Professor Takeo Igarashi of the Graduate School of Information Science and Technology, and Shimizu Corporation. Why have you chosen to do unconventional research projects? 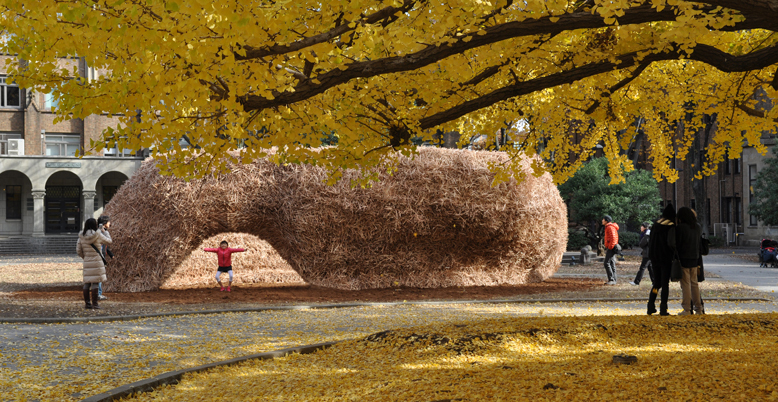 At London's AA School (Architectural Association School of Architecture), I did research on architecture produced using mushroom-hardened straw. A couple of examples of my research from my time thus far at the University of Tokyo include research into the use of cow dung as a building material and the repurposing of used paper to make differently-shaped bricks. In 2013, I created a pavilion called 99 Failures in front of Faculty of Engineering Building 1. To make that structure, research was conducted under the condition of encouraging students not to seek easy solutions but to challenge themselves to find harder ways of solving problems. This resulted in multiple failed attempts before a successful building was produced. My thinking at the time was "how can we come up with an idea that is out of the ordinary?" I believed that intentionally creating conditions conducive to failure would lead us to alternative possibilities that weren't bound by conventional thinking. 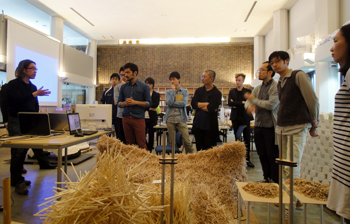 What is the difference between how architecture is studied in Western countries and in Japan? Much of the architectural research in Western countries tends to come from artistic and philosophical viewpoints. Contrastingly, the study of architecture in Japan is categorized under the field of engineering, so it tends to be thought of as a practical discipline. When looking at architecture through a sociological lens, which can encompass both Western and Japanese viewpoints, you can begin to perceive a research strategy that combines the good aspects of both. For instance, the standardized living environment that emerged from the mass production of goods in the twentieth century has been changing due to processes such as advancements in information technology. As a result, the ability to create goods made to each individual's specifications is currently in demand. With these social changes in mind, it is necessary to consider how architecture and cities should be designed. My laboratory was conceived as part of UTokyo's bilingual campus project called the Global 30 Architecture and Urban Design program (G30). Officially, only international students are members, but we also get active participation from Japanese students who are interested in our research. After G30 ended, we have launched a cross-laboratory research organization called T_ADS (the University of Tokyo Advanced Design Studies), in which we are currently working to create a melting pot kind of environment where ideas that go beyond a single professor's line of thinking can be brought into existence. What kind of research do you think is important within the architectural field today? It is vital that we research how to create architectures and cities that allow for the development of a society in which humans and machines can coexist. Globally, the study of architecture is replete with research on how to apply cutting-edge technologies such as those in computing and robotics. This research will make it possible for us to go beyond the standardization that was achieved in the twentieth century, when we strove to make our lives more efficient. However, if we focus solely on increasing technological efficiency, our research results run the risk of losing the ability to relate to human beings. While utilizing these new technologies, I would like to pursue not only speed and accuracy, but also the opposite—slowness and inaccuracy. This desire may be a human contradiction that cannot be understood by machines, but I believe it is important to our lives. When Professor Obuchi hitchhiked around America at the age of 17, he was awed by how old brick buildings were nicely renovated and stood alongside contemporary buildings. This fascination led him to start studying architecture. Perhaps his experiences from that time live on in how 99 Failures was designed. The pavilion, constructed in front of Faculty of Engineering Building 1 in 2013, was researched under his belief that failures produce creative thinking and outcomes. Why did you make a structure out of chopsticks? I thought it would be an interesting idea to apply 3D printing, an area that will revolutionize manufacturing, the medical industry, and other fields, to architecture, but printing out a large building in its entirety would require a gigantic printer. That's why we came up with a plan for a collaborative human-machine "3D printer" that networks workers on-site through handheld "printing" devices. We used one million wooden chopsticks as building materials since they were small and capable of aggregation. There are a few other reasons that factored in to why I went with chopsticks. For instance, in consideration of sustainable building materials, I wanted to use something that could be recycled and that everyone is familiar with (all of the chopsticks we used were made in Japan from thinned trees). Another reason is related to what I experienced when I was 17 years old and hitchhiking around America: I learned to be resourceful, creative, and make use of anything. What is great about architecture is that we can build a layer of ideas that can be understood, interpreted, and experienced physically and emotionally.